The Process by which specific traits or genes are selected due to some environmental advantage is called Natural Selection. In the context of evolution, certain traits or alleles of a species may be subject to Natural selection. Under selection, individuals with advantageous or “adaptive” traits tend to be more successful. They contribute more offspring to the succeeding generation than others do. The offspring will inherit those traits from their parents. Therefore, selection can increase the prevalence of certain traits. When selection is intense and persistent, then adaptive traits become universal to the population or species. Natural Selection depends on the conditions in which the individuals of a species find themselves. Adults, juveniles, embryos, and even eggs and sperm may undergo selection. Factors affecting selection include limits on resources (nourishment, habitat space, mates) and the existence of threats (predators, disease, adverse weather). Biologists called such factors as selective pressures. Natural selection is the most familiar type of selection, In this case, nature selects the fittest organisms. 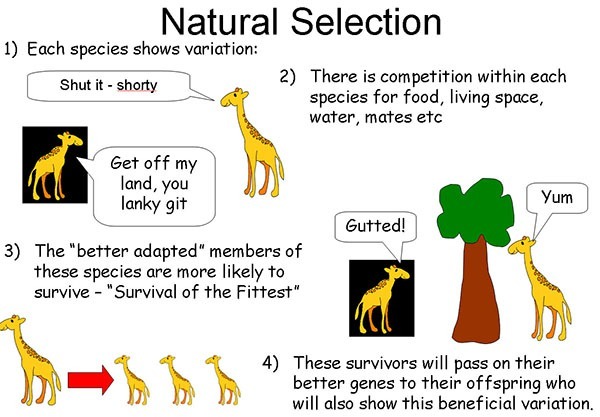 There are different types of natural selection: sexual selection, ecological selection, stabilizing selection, disruptive selection and directional selection. Selection occurs only when the individuals of a population are diverse in their characteristics. In the absence of individual variation, or when variations are selectively neutral, selection does not occur. Selection does not guarantee that advantageous traits or alleles will become prevalent within a population Through genetic drift, such traits may become less common or disappear. In the face of selection even a so-called deleterious allele may become universal to the members of a species. This is a risk primarily in the case of “weak” selection or small populations. Though deleterious alleles may sometimes become established, selection may act “negatively” as well as “positively. Negative Selection decreases the prevalence of traits that diminish individual’s capacity to succeed reproductively (i.e. their fitness). Positive selection increases the prevalence of adaptive traits. Aspects of selection may be divided into effects on a phenotype and their causes. The effects are called patterns of selection. They do not necessarily result from particular causes (mechanisms). In fact, each pattern can arise from a number of different mechanisms. Stabilizing selection favors individuals with intermediate characteristics. Disruptive Selection favors those with extreme characteristics. Directional Selection occurs when characteristics lie along a phenotypic spectrum and the individuals at one end are more successful. Balancing Selection is a pattern in which multiple characteristic may be favored. Distinct from patterns of selection are mechanisms of selection; for example, disruptive selection often is the result of disassortative sexual selection. Similarly, balancing selection may result from frequency-dependent selection and overdominance.